It was revealed that famed actress Scarlet Johansson just got engaged this week. The news came with pictures of her absolutely beautiful Art Deco diamond engagement ring. The elongated style features a geometric design set with a larger central diamond that is a timeless look with a wonderful vintage flair. Vintage engagement rings have made a strong comeback in recent years. They are often more affordable than newer options, and feature unique designs that set them apart from the classic solitaire style. Vintage and antique engagement rings are a perfect way to show how individual and special your love is. We are huge fans of vintage jewelry, in general, and vintage engagement rings in particular! Here’s a list of five of our favorite vintage engagement rings! If you’re looking for something totally different that still echoes with the classic style of pale diamonds, this Art Deco emerald ring is just the thing. Sleek platinum forms a softly rounded navette shape that features a brilliantly green center emerald flanked by diamonds. More diamonds adorn the elegant geometric mounting for a glittering look that still manages to exude understated style. Similar in style to Johansson’s ring, this Art Deco offering is a welcome departure from the traditional solitaire. Elongated and luxurious, this vintage ring features a larger central diamond framed by a geometric platinum design. One of our all-time favorites, this elegant Edwardian cluster ring is beyond beautiful. The antique design features feminine filigree details with a prismatic cluster of round diamonds along the top. 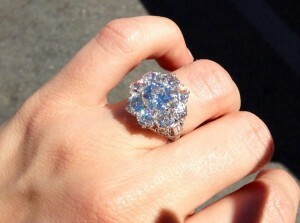 Colored stones are a wonderful way to differentiate your engagement ring from the sea of diamonds. We love this Art Deco design, with a sleek gold shank adorned with diamonds in geometric style and a perfectly plum amethyst of very vibrant tone. Sweet, ladylike and delicate, this vintage diamond and ruby ring is a truly subtle treat — with a bright burst of fiery red! Easy to wear for even the most active lifestyle, this engagement ring elevates the solitaire style with a dusting of diamonds and two blazing rubies. If you’re searching for the perfect engagement ring, make sure to check out our bridal boutique, and follow us on Instagram for more great pictures of some of our favorite pieces!